Ledco 25" Pre-Masker Tape Applicator Cold pressure sensitive Roll Laminator model EP-25 in 110 or 220 volt, and now with 2 year warranty. 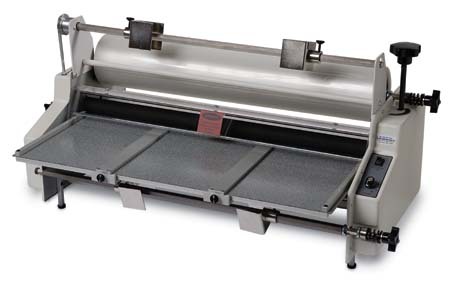 The Ledco 25" Pre-Masking Tape Applicator cold ( pressure sensitive PSA ) roll laminator has the ability to set the roller gap for up to 7/16" thick materials. It's a solution to transfer taping and vinyl application headaches for many shops. Ships FREE via freight in the lower 48 states !